Round 8 of the Circle of Friends Remix is now open for reading at cof_remix. Rating: I guess PG-13? No worse than was on the show. I’m really bad at guessing ratings for writing. Disclaimer: Characters from Buffy the Vampire Slayer are property of Joss Whedon, Mutant Enemy, Kuzui Enterprises, Sandollar Television, the WB, and UPN. Characters from The Walking Dead are property of Image Comics, AMC, Robert Kirkman, Tony Moore, Frank Darabont, and anyone else that I might have forgotten. Rating: PG-13, I think. No worse than the show, really. Notes: Apologies for how short this section has been and how long it has taken for me to post. I've been knocked literally flat on my back due to back pain, and that is really not a position that is conducive to writing. Today has been my first day sitting up in a while. Part One: Can be found here. Part Two: Can be found here. I promise I am still hard at work on "As Water Unto Wine". I just had a very active past four days, with no time to write after Thursday (and I can't take away from sleep time because I've been getting three or four hours). I have no plans now until Thursday, though, so writing will resume today (Monday the 11th) and there's no reason to not expect a post coming in, as well. I just wanted to reassure that I hadn't dropped it, I have just had no time, and what little writing I have managed to do was on my phone, so it's riddled badly with typos because I have a small phone and small hands that aren't small enough to type coherently on the tiny keypad. Round 7 of Circle of Friends is still here! You can find the stories at cof_remix. Explanation: I am posting this story in parts because this month has been a crazy, crazy month and I’ve dislocated my shoulder twice in nine days, with the second one being yesterday. I will do this story quickly, but it just wasn’t ready in time to post completely today. I talked to aadler, and didn’t make the decision on my own. I could have posted what I’ve written so far and had a complete story that I’d be (mostly) satisfied with, but it’s not the story I wanted to tell yet. But it will be. Oh how it will be. I saw that aadler already posted a thing about it, so here’s a bit more detail on everything that’s happened regarding my husband. Irish had a deadline at work on Wednesday, and he never eats right or gets enough sleep beforehand. Everyone in the office loses weight in the time leading up to a deadline. He and his coworkers went out celebrating after the deadline. Normally he doesn’t get home until two thirty at the earliest on these nights, but he came home by eleven thirty and went directly to sleep. He woke up an hour later and started vomiting. I assumed it was a hangover. He was still sick the next day, didn’t eat anything, but did walk to and from the store. Friday he got weird. I woke up to him having plugged the bathroom sink up, knocked everything in, and was flooding it with the water going full blast, muttering about “45 degrees 45 45 45 45”. I managed to get him back to bed. He talks in his sleep, so I assumed it was just an extension of that. He started making less and less sense, but whenever I said I thought he needed to go to the doctor, he’d say that he was fine, he didn’t need a doctor. It was one of the few times he was actually coherent. He did something that, on the surface, isn’t that worrying but that I have literally never seen him do without a reason for it, and that worried me more than the bathroom flooding. I tried to get him to eat something, thinking that he probably had low blood sugar since he hadn’t eaten since Wednesday night and it was at that point 3 on Friday afternoon. He wouldn’t eat, and I called his parents to help me get him to the doctor. His parents texted me when they thought they were fifteen minutes away. He was able to help me get pyjama pants on him and his slippers on him, but not his shirt. By the time his parents got there five minutes later (because traffic was actually good for them), he’d gone mostly non responsive. He’d look at us when we talked, and he’d grunt, but he wouldn’t say any actual words beyond “yeah” and “nuh”. We called an ambulance and waited. In the ten minutes or so that we waited for the ambulance, his breathing changed and we called back. The dispatcher was nice and kept us calm and told us that they were also sending the fire brigade so that someone would get there as fast as possible. He had Irish’s dad put his hand on Irish’s chest and just say “now” every time Irish breathed. He stayed on the phone with us until the firemen got there. By the time they got there, he’d stopped responding completely, other than flicking the eyes at us sometimes when we talked to him. He’d been able to squeeze my hand when I asked him to before, and he wasn’t able to by then. Irish’s blood sugar was 24 when normal levels are 6. We got to ride in the ambulance with the sirens going. Not as much fun as it sounds, and I never thought it sounded particularly fun. By the time we got to the hospital, his blood sugar had climbed to 35. He responded to insulin treatments and the doctors thought it was Diabetes Type One, because he wasn’t showing any signs of abdominal pain, which pancreatitis would have. They flat out told us it was Diabetes Type One. He was awake and talking a little bit when I got to visit with him; he said “I love you, too” and squeezed my hand. I sang our wedding songs to him quietly and he touched my face. They moved him up to ICU before we left for the night. He was responding slower to the insulin drip than he should be if it were diabetes, so they tested him for pancreatitis on Saturday morning. Turns out that’s what it is, even though he didn’t get the abdominal pain until Saturday afternoon. He took a turn downhill Sunday morning. At 5:30, he started saying things that didn’t make sense again, and his breathing got shallower. They decided to intubate him and have him on the ventilator, and also do dialysis. They told me that he was fine and that I didn’t need to come in before visiting hours. We went in to visit him this afternoon. He’s really swollen from the fluids but he’s doing much better. They have him in a medically induced coma for now, just to give his body a chance to heal. His blood levels are actually equalizing better than they have been, so the dialysis is doing its job. They have him on a broad spectrum antibiotic for the pancreatitis. And that’s where we’re at right now. I’ve been staying with his parents, but I’ll be going home tomorrow evening. Round 6 of Circle of Friends is still here! You can find the stories at cof_remix. Rating: PG-13? Mild cursing, at any rate. Disclaimer: Characters from Buffy the Vampire Slayer are property of Joss Whedon, Mutant Enemy, Kuzui Enterprises, Sandollar Television, and the WB and UPN. Notes: aadler is still working on his remix, so this is by no means to replace that; I checked with him to find out if he'd like me to do a pinch hit for until he finishes is, and he agreed. And then my mom arrived in Ireland and I proceeded to get sick as a dog, so I haven't had a chance to work on it until today. So, Eiland, I hope you like your pinch hit, and I can't wait to read Aadler's real story for you! 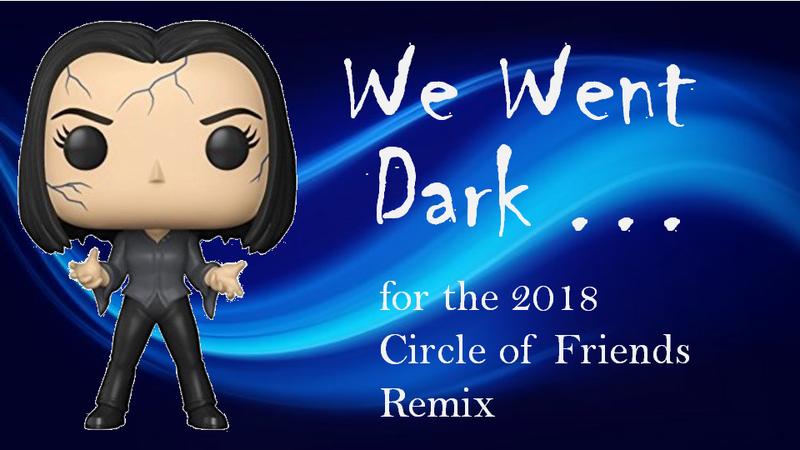 Round 6 of the Circle of Friends Remix is now open for reading at cof_remix. Rating: I guess PG-13? No worse than was on the show. Disclaimer: Characters from Angel are property of Joss Whedon, Mutant Enemy, Kuzui Enterprises, Sandollar Television, and the WB.